I am using Moto E powered by Android Kitkat. When I receive an SMS, I get a notification displaying the sender name with the message. I don't want the message text to be displayed in the notification, just the sender name is enough. How can I prevent the message text from being displayed? Chomp SMS also works fine. We can choose what to display in the notification bar. In privacy mode, we can hide name, text and both. 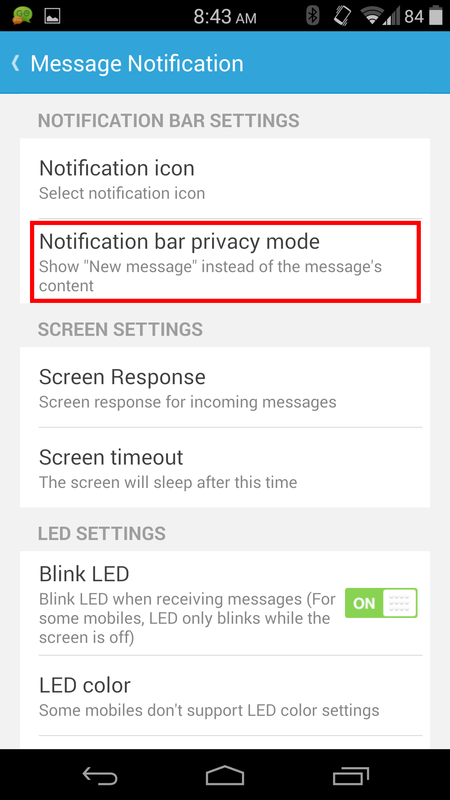 GoSMS Pro has a "Notification bar privacy mode" option, which 'shows "New Message" instead of the message's content'. I personally use Sliding SMS (which is a standalone app created for and taken from CyanogenMod 10). 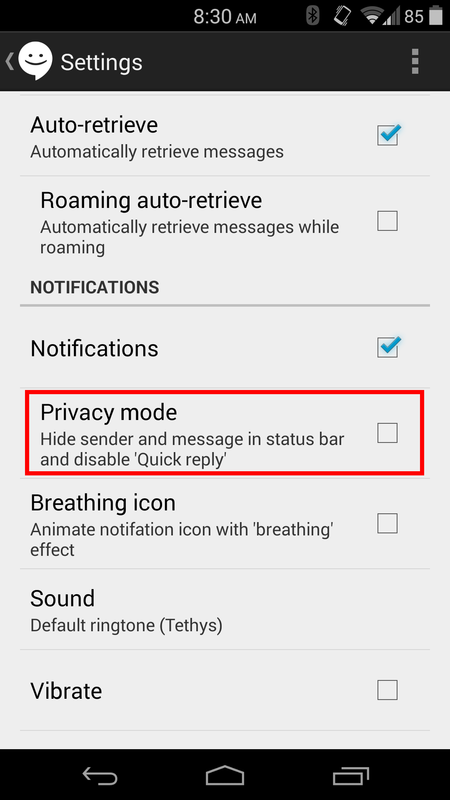 It has an option to enable "Privacy Mode", which hides the sender and message from the status bar notification. 8sms (which is also from CM10 M2) also has this option. Third party sms app like Handcent SMS ,8sms and Go sms etc have option to hide the notification message from the status bar. Just go to these sms app. In settings you will find option to hide the message content in notification bar. [SOLVED] How do I unmute a contact? [SOLVED] How can I remove/hide the Skype Status notification?